THE RISK OF FIRE BREAKING OUT ON BOARD A SHIP CANNOT BE ELIMINATED BUT ITS EFFECTS WILL BE MUCH REDUCED IF SAFE PRACTICES ARE ADHERED TO ALL TIMES. TRAINING IN FIRE-FIGHTING PROCEDURES AND MAINTENANCE OF EQUIPMENT SHOULD BE ASSURED BY REGULAR DRILLS. ACCESS TO FIRE-FIGHTING EQUIPMENT SHOULD BE CLEAR AT ALL TIMES AND EMERGENCY ESCAPES AND PASSAGE WAYS SHOULD NEVER BE OBSTRUCTED. A FIRE CAN USUALLY BE PUT OUT MOST EASILY IN ITS FIRST FEW MINUTES. PROMPT AND CORRECT ACTION IS ESSENTIAL. IF FIRE BREAKS OUT, THE ALARM SHOULD BE RAISED AND THE BRIDGE INFORMED IMMEDIATELY. IF THE SHIP IS IN PORT, THE LOCAL FIRE AUTHORITY SHOULD BE CALLED. IF POSSIBLE, AN ATTEMPT SHOULD BE MADE TO EXTINGUISH OR LIMIT THE FIRE, BY ANY APPROPRIATE MEANS READILY AVAILABLE, EITHER USING SUITABLE PORTABLE EXTINGUISHERS OR BY SMOTHERING THE FIRE AS IN THE INSTANCE OF FAT OR OIL FIRE IN THE GALLEY. THE DIFFERENT TYPES OF PORTABLE FIRE EXTINGUISHERS ON BOARD ARE APPROPRIATE TO DIFFERENT TYPES OF FIRE. WATER EXTINGUISHERS SHOULD NOT BE USED ON OIL OR ELECTRIC FIRES. OPENINGS TO THE SPACE SHOULD BE SHUT TO REDUCE THE SUPPLY OF AIR TO THE FIRE AND TO PREVENT IT SPREADING. ANY FUEL LINE FEEDING TO THE FIRE SHOULD BE ISOLATED. IF PRACTICABLE, COMBUSTIBLE MATERIALS ADJACENT TO THE FIRE SHOULD BE REMOVED. IF SPACE IS FILLING WITH SMOKE AND FUMES, ANY PERSONNEL NOT PROPERLY EQUIPPED WITH BREATHING APPARATUS SHOULD GET OUT OF THE SPACE WITHOUT DELAY. AFTER A FIRE HAS BEEN EXTINGUISHED, PRECAUTIONS SHOULD BE TAKEN AGAINST ITS SPONTANEOUS RE-IGNITION. PERSONNEL SHOULD NOT RE-ENTER A SPACE IN WHICH FIRE HAS OCCURRED WITHOUT WEARING BREATHING APPARATUS, UNTIL IT HAS BEEN FULLY VENTILATED. 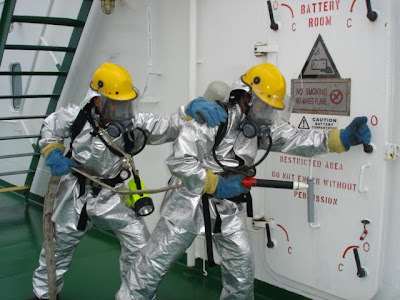 · REPORT TO C/E/O, WHO WILL THEN IN CONSULTATION WITH MASTER SHALL RELEASE CO2 INTO THE ENGINE ROOM.